In Paul’s letter to the Ephesian church, Paul instructs the believer in which armor was necessary to wear in this spiritual battle we’re in. He tells us things like… we need to have “our loins gird about with truth” or simply a belt of truth. Truth is what holds our lives together. As he progresses through the various articles of armor we come to verse 16 in which Paul says “above all, taking the shield of faith, wherewith ye shall be able to quench all the fiery darts of the wicked.” It becomes clear that Paul placed the shield in high regards. 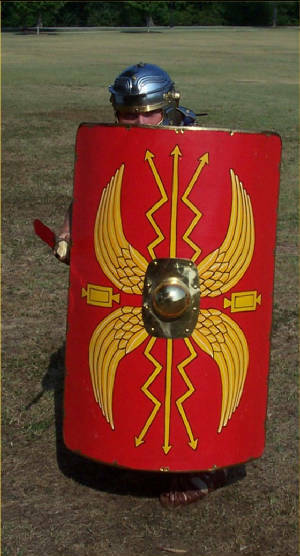 As you can see the shield also contained a knob in the middle of the shield which served as a fist and they would literally punch their enemy and drive them back. It was more than just a defensive weapon, the shield enabled the soldier to keep moving forward! And when Paul spoke of our spiritual armor, he said above all take the shield of faith! Faith will serve as your shield in this battle! It will protect you from the flying fiery darts of the enemy! And it will provide you with the ability to push the enemy back in your life, and keep moving forward in God! If we need anything in 2015, we need a restoration of faith! A faith that isn’t connected to what we know, but a faith that is driven by who we know! A faith that can’t be shaken by circumstance, but a faith that will shake our circumstances! 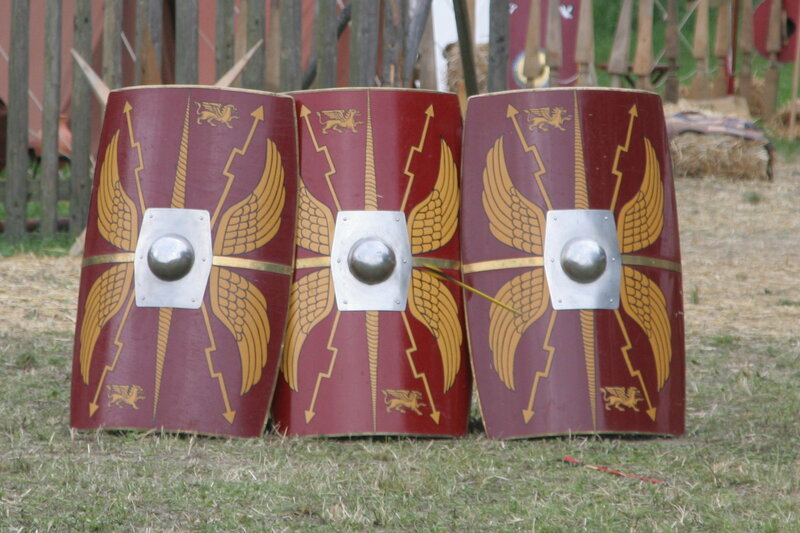 the shields would literally provide a shell of protection or a covering around the troops and they would walk completely engulfed under the shields.The purpose of this military formation was so that these Roman soldiers could march through flying arrows, without injury. They could march towards city walls and not be harmed by flying objects. They were protected under the covering of shields and the enemy could do nothing to stop the progress of these valiant warriors! It’s time for the church to get out of our selfish mentalities and realize that 1 may put a thousand to flight, but two shall put ten thousand to flight! As powerful as one shield can be! 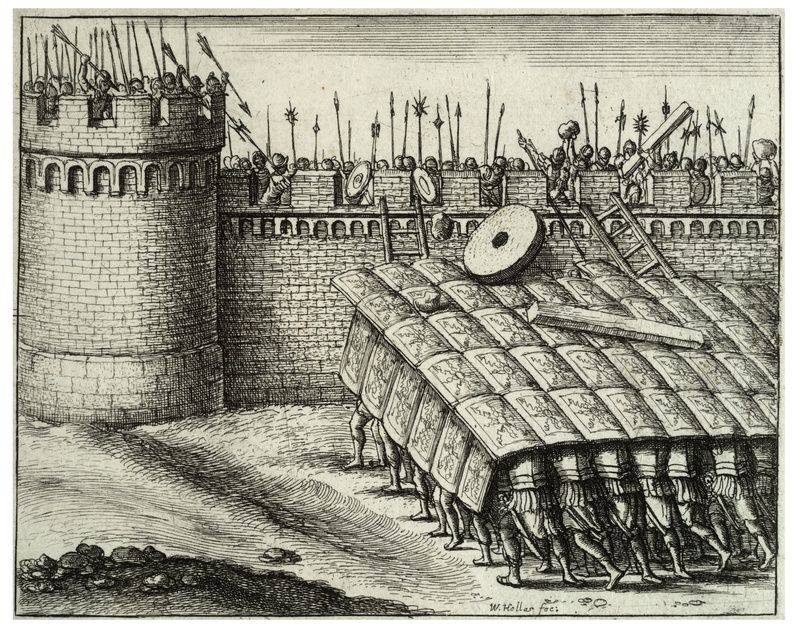 We need a revelation that the church becomes an unstoppable force, when the shields are used collectively! The word faith here in Hebrew is a picture of a pillar. A pillar supports the door and holds the door in place so that people can walk through that door. The word here literally means to support, uphold or to confirm. When God said they were children of no faith, He was saying that they do not support, they do not uphold and they do not confirm that He is God. And when God saw that His people would not stand as that pillar, God was provoked and He despised them! You see when you can support career over church; you are children of no faith! When you can uphold the rigorous schedules of your children’s after school activities and sports practices, but you cannot uphold faithful attendance to church, you have become children of no faith! When you can uphold the financial obligations of things you don’t need, but you cannot uphold the financial responsibility of tithing, you are children of no faith! And when you can confirm, or establish the truth of the things of this world, but you cannot confirm your God, you have become children of no faith! This word was used again by the Prophet Habakkuk as he prophesies of a vision that is for an appointed time, he says in Habakkuk 2:4, “Behold, his soul which is lifted up is not upright in him: but the just shall live by his faith.” The word live here in Hebrew literally means to remain alive, to preserve or to nourish, revive and restore! In other words when faith is that pillar in your life! And you support the church, and you uphold God’s laws, and you confirm your experience in your lifestyle choices; then your faith will keep you and nourish you! Faith must be the pillar of the church! When faith is the pillar, the church has a shield! The Bible says when Isaiah saw the Lord high and lifted up, and the angels flying around the throne crying Holy, Holy, Holy; that the posts, or the pillars began to move at the voice of him that cried. And the house was filled with smoke! Look at what happens when worship meets faith! • The glory of the Lord moved in! • Isaiah cried WOE IS ME; conviction moved in! Because sin cannot dwell in the presence of a Holy God! Let’s take this a step further, when Samson was grinding meal in the Philistines meal house. The Bible says that Samson was blind, bald and weary. Which spiritually means he had no vision, covering or strength. And so we preach that Samson’s hair grew back. You see I preach that Samson’s strength wasn’t in his hair. And if his strength wasn’t in his hair, then how did he regain strength when his hair grew back? But when you read the story the Bible says that when Samson was weak, he asked a boy to lead him to a pillar! Samson regained his strength, when Samson leaned on faith! And sometimes you may find yourself in a place where you don’t have faith, but that’s when you can stumble to a pillar! And the strength of the body can restore strength to the individual! Because a singular shield will protect one man! But when the shield is used collectively I can rest under the shield of a brother until I’m strong enough to use my own shield again! 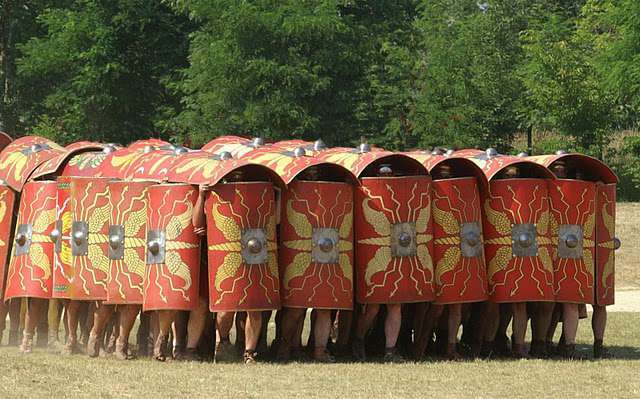 We need to learn the power of the testudo; where our children aren’t vulnerable to the tactics of the world, and our teenagers aren’t left alone to defend themselves against the temptations of our day. But the church can be that pillar! And we can take our shields of faith, and we can cover them and protect them! And when they fall, we don’t judge them, but we bring them to a pillar and we let the strength of the pillars restore strength to the weak!